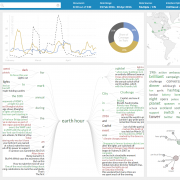 The Media Watch on Climate Change (MWCC) is a visual analytics and knowledge co-creation environment developed in WP3 of DecarboNet. 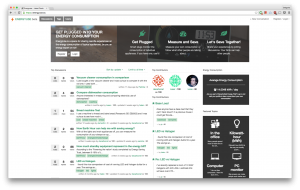 It allows users to track and discuss emerging trends in the public dialog, and to better understand the social perceptions of environmental topics. 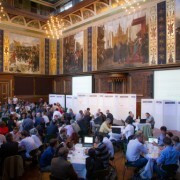 The Web portal is publicly accessible at www.ecoresearch.net/climate, providing access to a continuously updated archive of news and social media content that reflects the public climate and energy debate. The portal’s analytical portfolio not only provides customized information services for citizens, but also important insights for policy makers, NGOs and other environmental stakeholders. 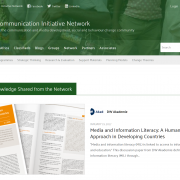 The MWCC helps these stakeholders to develop better strategies for engaging audiences, guides their communication and public outreach campaigns, and increases the effectiveness of communication-related decision making processes. An important part of the work in WP3 has been the development of visual analytics tools to better understand the context of Web coverage by establishing connections between named entities (persons, organizations, and locations), based on references to these entities in the MWCC knowledge repository. 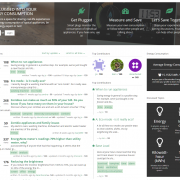 EnergyUse is Decarbonet online community for sharing real-life experiences on the energy consumption of typical appliances, for energy experts or not! The electricity monitors provided by Green Energy Options can be a powerful instrument to transform everyone into an energy expert. By installing them, people can compare the consumption of similar appliances, test different settings to perform daily activities like doing the laundry, hoovering, etc. They can also assess the efficiency of changes in energy behaviour. EnergyUse is the place where this knowledge can be shared and spread to the world! Users can navigate discussions by tags associated to appliances or contexts of energy usage (e.g., working in the office, breakfast). Discussions are open to everyone, but users of energy-monitoring devices from Green Energy Options, can also view the electricity consumption of specific devices and appliances, or of their entire households, and compare with the community’s average. Visit EnergyUse.eu and join the community! In the spirit of ideas worth spreading, TEDx is a program of local, self-organized events that bring people together to spark deep discussion and connection. 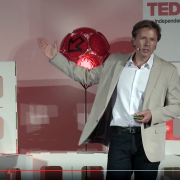 TEDxModulUniversity was an independently organized TED event and the first of its kind held at a university in Vienna, hosted and organized by a young and passionate team of volunteers. 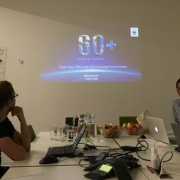 In one of the talks, Arno Scharl presented automated methods to analyze digital communication – trends in news media coverage, for example, or the discussions on social media platforms. He introduced two applications that visualize how societal issues of global relevance are being perceived by various stakeholders, drawing on the technologies developed within the DecarboNet project and with a special focus on sustainability communication and UNEP Live, the platform of the United Nations Environment Programme (UNEP). The DecarboNet team thanks GTDT folks in Toxteth, Liverpool, for all the insightful discussions around bringing energy conservation to everyday life. In a series of 3 workshops we discussed values around energy saving, possibilities to change our energy use behaviour, and tips that can be shared. This exercise made clear to us that promoting energy savings is much more than providing people with technology. Also, it helped us to identify more appropriate ways to spread the energy conservation message to communities. 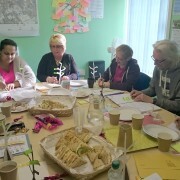 The participants are part of the L8 Living Sustainably, a project funded by the Big Lottery Fund’s ‘Communities Living Sustainably’. They promote local food growing, energy generation and educate people on the impact of climate change and the measures they can take to improve their lives. DecarboNet energy trial has started with around 100 households in England. The participants received our energy monitors and joined Energynote, an online electricity monitoring service provided by GEO. 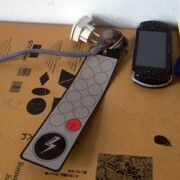 They are now invited to explore the smart plugs to learn about using individual appliances more efficiently. There is more to come in 2016! 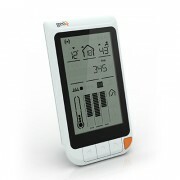 Interested in learning about your appliances’ energy consumption? If you want to become more aware of energy consumption at your house and fancy the idea of sharing saving experiences with others, let us know. 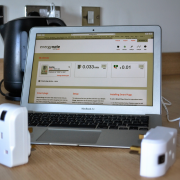 You can receive a free kit of energy monitor + smart plug (in Europe only). WWF Switzerland and IKEA are working together to engage families with energy savings using the Utility Toolkit, a downloadable game developed by WAAG Society as part of DecarboNet. More information about this initiative is available at WAAG website and IKEA’s blog.